Today, Tangerang is synonymous with real estates and factories. Begin your exploration from Pasar Lama and discover more marvelous things. Being next door to Jakarta has its benefits. Tangerang is part of the most dynamic and modern economic engine and community in the country. The most obvious results: an airport, a series of valuable real estates, and a vibrant manufacturing sector. 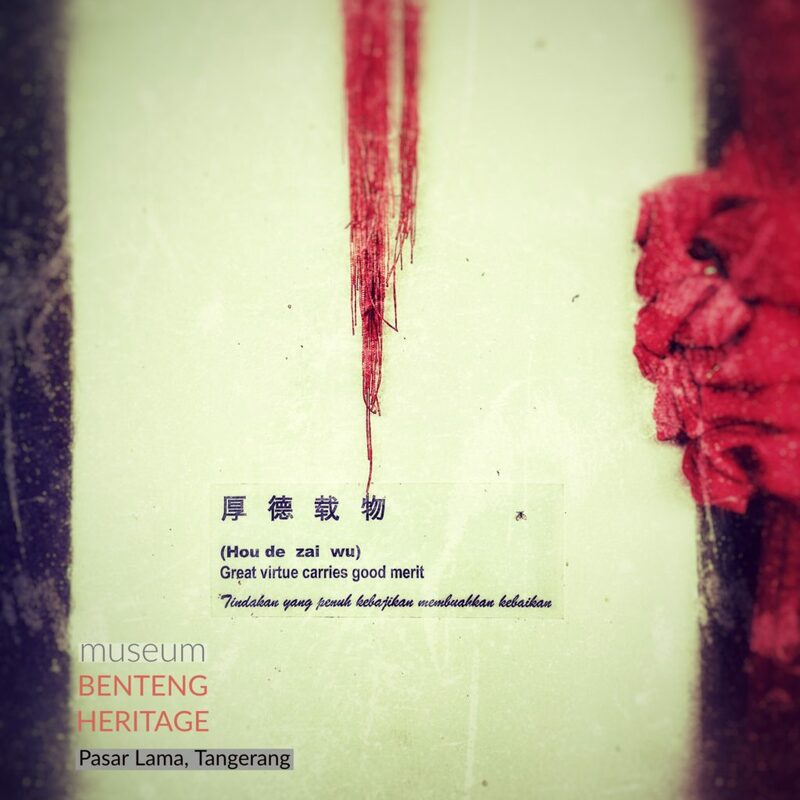 But Tangerang has its own proud history, its own culture and traditions, its own characters. They are not immediately obvious when you are just driving in the toll road, traveling in a train, or riding you bike to work or school. 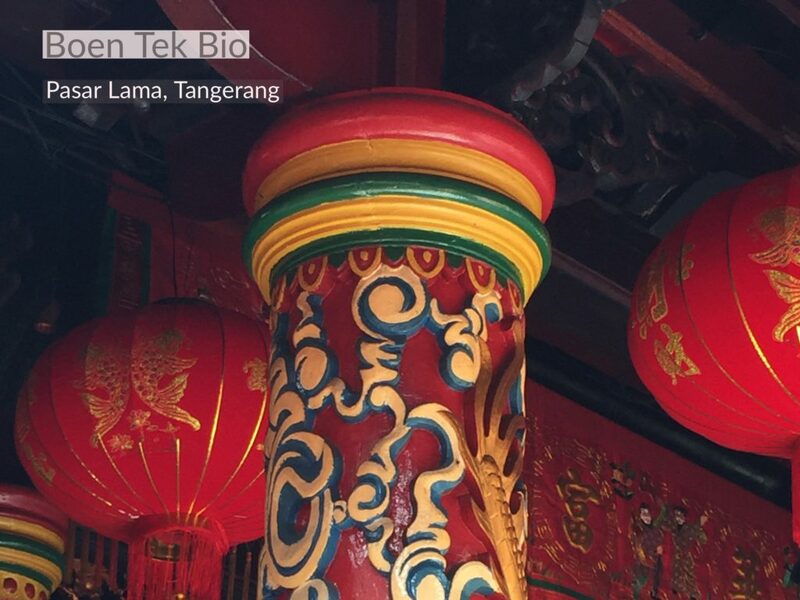 To see the real Tangerang, you have to travel on foot to explore the different sides of the city. There is no other place to begin than in Pasar Lama (Old Market), the oldest part of this burgeoning city. Just like in other Indonesian cities, Tangerang’s old town is more of an economic and cultural center than a political one. 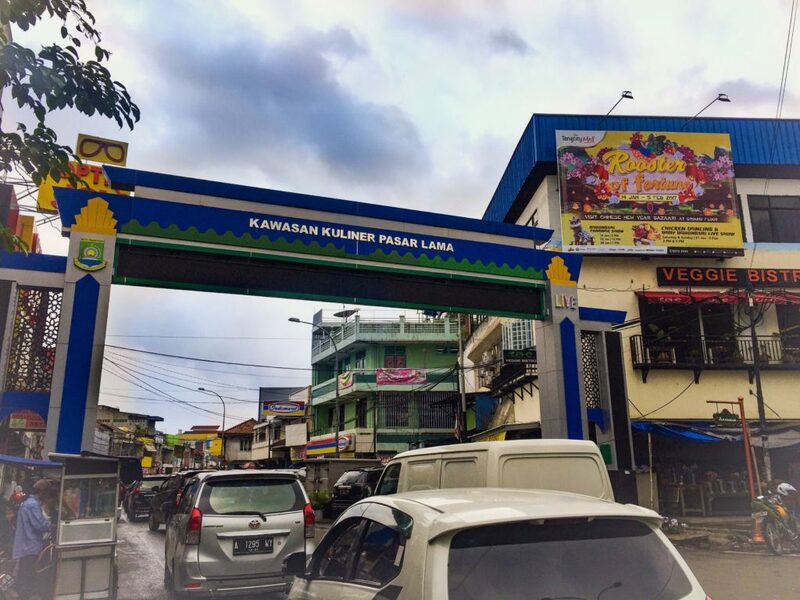 A big sign welcoming to the culinary travel district of Pasar Lama will greet you. After that, shops, street vendors, advertising billboards, delivery trucks, and thousands of shoppers and business people will fill your view. You need to go pass this commotion to see the heart and soul. And in this case, you need to enter the one of the small alleys and it will take you to the old residential quarters. Here, you can trace the origin of the city. 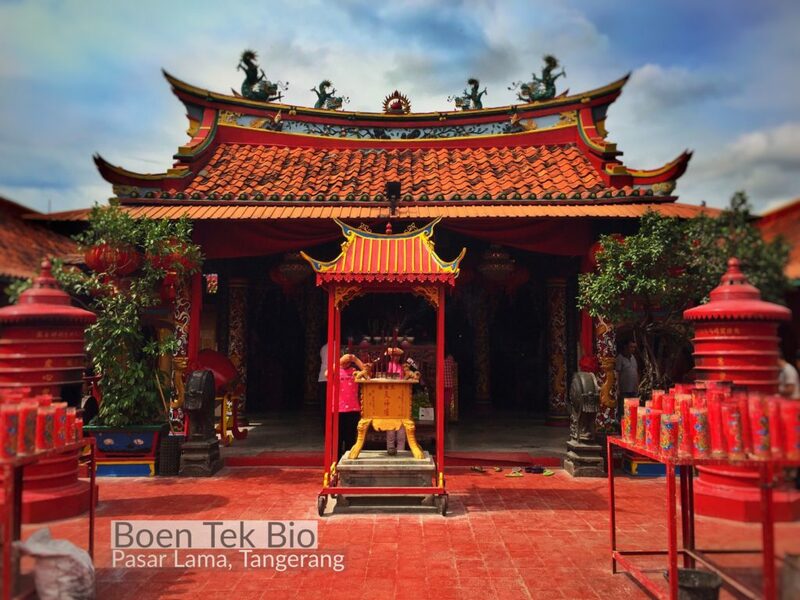 At the center, Boen Tek Bio Temple stands proud. Two other old temples (or “kelenteng”) exists, but this one is the oldest. This Chinese temple dates back to the 17th century, but the Chinese community has been living in the area for much longer. A traditional market grows and prosper around the temple. There are those who sells religious items for the pilgrims and visitors to the temple, but mostly the market sells foodstuffs. You can find agricultural produces, fishes and snacks. 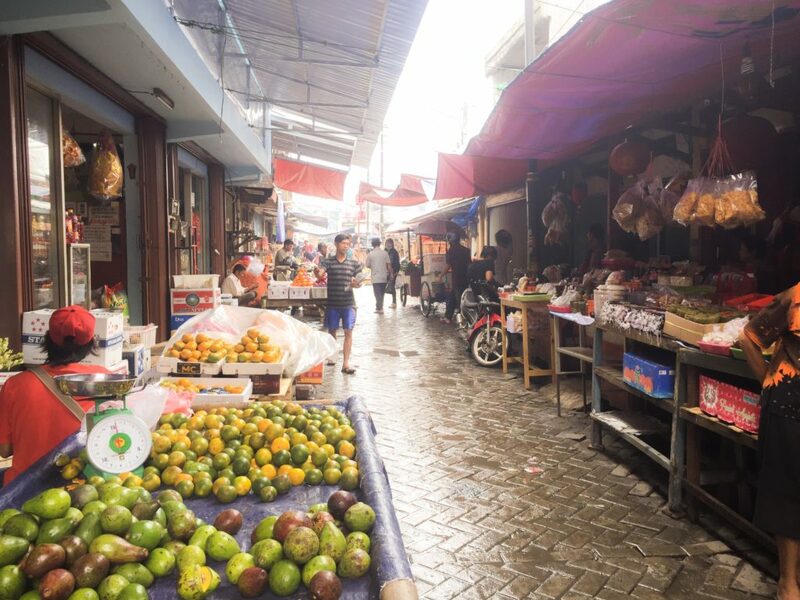 All these businesses create a distinct busyness and atmosphere that you can only found in traditional market. There is a street next to the temple. If you walk along this street, you can seen the back entrance to the temple, styled in Indian Buddhist architecture. This reflects the closeness of Buddhism and Chinese traditional religions in the community and how the temple serves adherents of both. Walk further and you will find a beautiful traditional Chinese house, more lavish than the other houses and well maintained. The building used to belong to a rich and powerful family, but it has been remodeled into a museum dedicated to the history of the Chinese community of Tangerang. 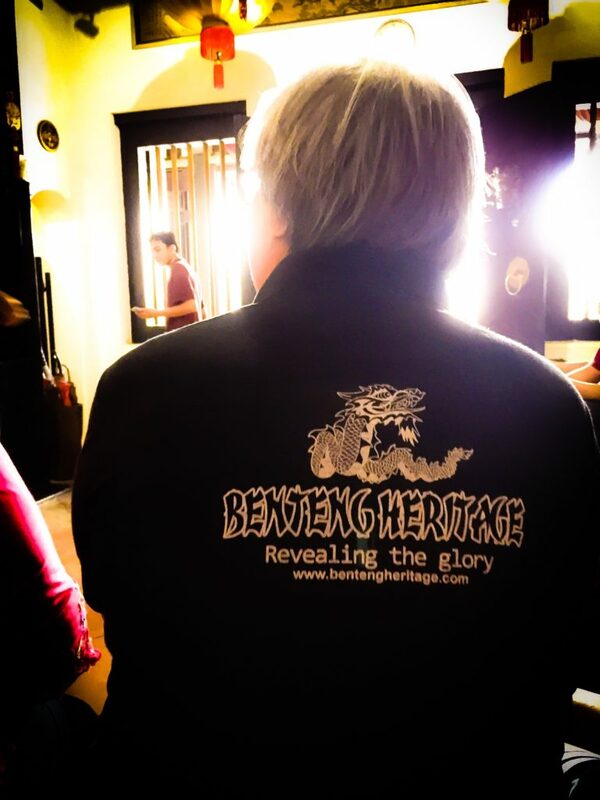 Museum Benteng Heritage officially opened in 2011. It is not government-owned, it is privately-funded and managed. If you are lucky, you can meet with the man behind this heritage project while you visit the museum. Mr. Udaya Halim is quite a busy person now, being a history and cultural expert means a lot of people will seek him for advises and information. There are two lion statues in front of the museum, traditional style. And just next to the wooden doorway, a plaque is hung, quoting words of wisdom. Passing the door, you will come to a “front office,” so to speak, where you can buy tickets and ask for a guide to take you through the museum. There are lots of pictures hanging on the wall, giving us a glimpse of how the city looks like in the ages past. Camera is not allowed inside the museum. Bad news for many visitors, but considering our contemporary style–and selfies–over substance mindset, I can understand why. The stories and artifacts are very interesting and authentic, people should pay attention instead of clicking and posing for cameras. The museum’s building is part of a larger building that used to belong to a prominent family. It was later divided into three sections, each inherited by the three sons of the owner. Two of the sections have been purchased and reintegrated into this museum. The artifacts inside the museum are all authentic from the area, although not all are from thr original building. There are four parts that are still authentic of the original structure: the tiles (as you will immediately see and step on the moment you enter the building), the wooden structure, the secret door (it is a “secret,” so you need to visit yourself to know it), and the decorative panel inside (this one is pretty amazing and beautiful, something you should see with your own eyes). Among the artifacts housed in the museum are women’s shoes (that little shoes worn by adult women that you might have heard about), smoking apparatus from the days when opium was legal, various dresses and household items, a wooden bed, and a praying altar. Two things for special mention: there is a hundreds of years old idol of a deity, still protecting the house after all these centuries, and a collection of martial art novels (for lovers of the genres, the famous writer and translator OKT is resident of this quarter, his house still stand not far from Boen Tek Bio). Other interesting heritage sites are old soy sauce (or “kecap”) factories, Roemboer Tangga Ronggeng, and an old mosque. Roemboer is short for “roemah boeroeng” or bird house, written in old Indonesian spelling. The mosque is also hundreds of years old. The fact that it is located so close to the city oldest temple and its large Chinese community tells us a lot about the cooperation and relationship of the city’s various groups in the past. 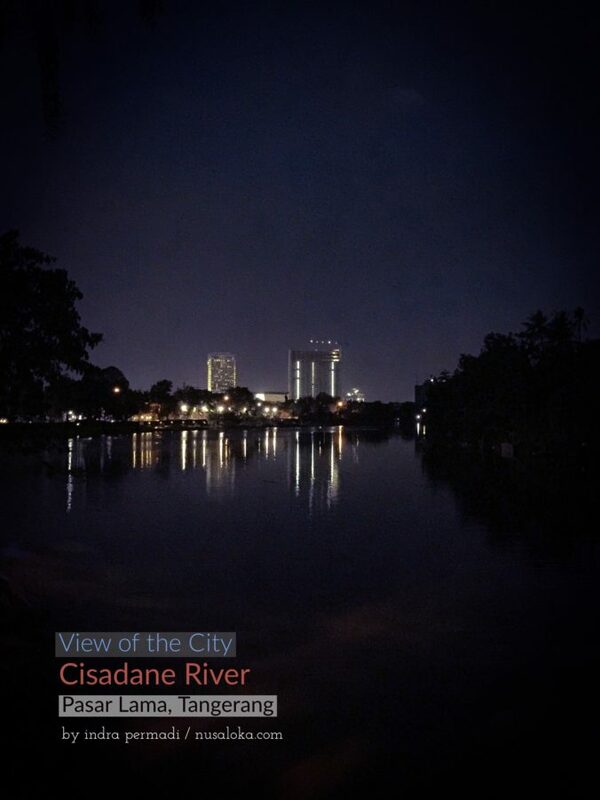 A short walk from Boen Tek Bio and the market and residences around it, you will arrive at the bank of the Cisadane River. 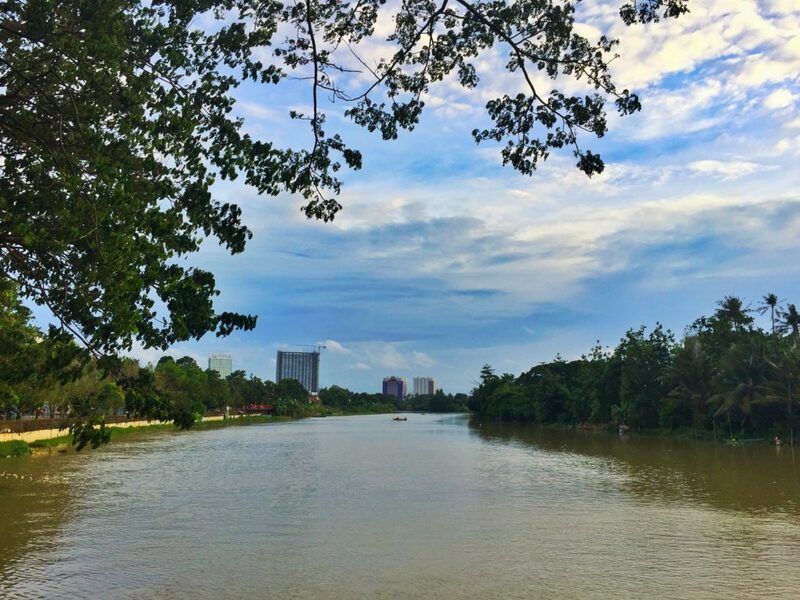 The river is wide and the water plentiful, something you can hardly found in Jakarta. The river banks is full of trees and there is a pathway for people to walk along. There are many food sellers along this road, street vendors and permanent restaurants. Among the big ones that you would notice immediately are Roti Bakar 88 and Es Duren Mang Entus. If you stay long enough for the sun to set, you should walk back to Kisamaun Street, the main street of this old town. If shops rule during the daylight, at night time the street is the place for street food. 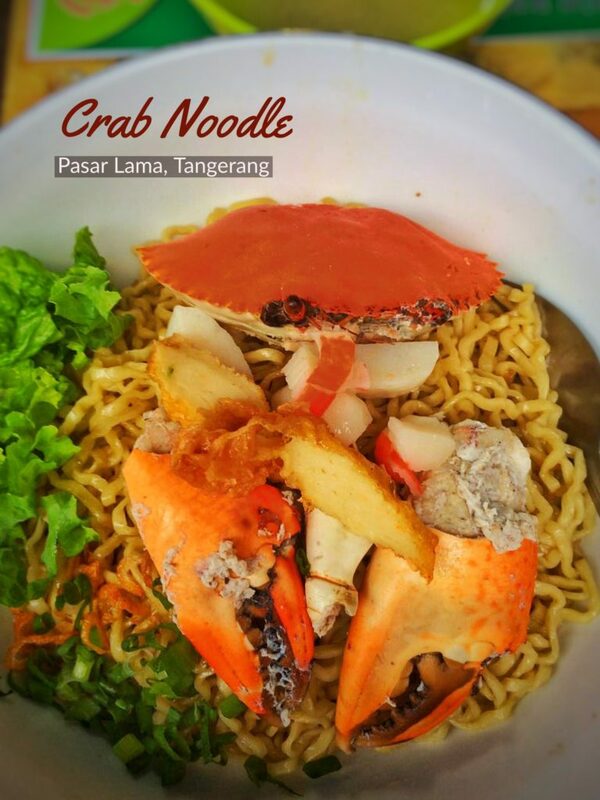 This culinary bazaar is why Pasar Lama is called the Culinary Travel District of Tangerang. 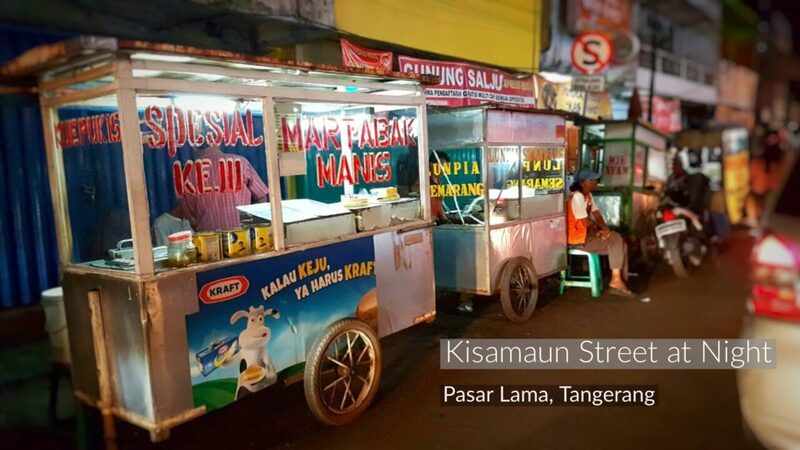 Along this street you can find Indian roti cane, Chinese meat balls and noodles, Indonesian satay, crab porridge and noodle, and many, many more. 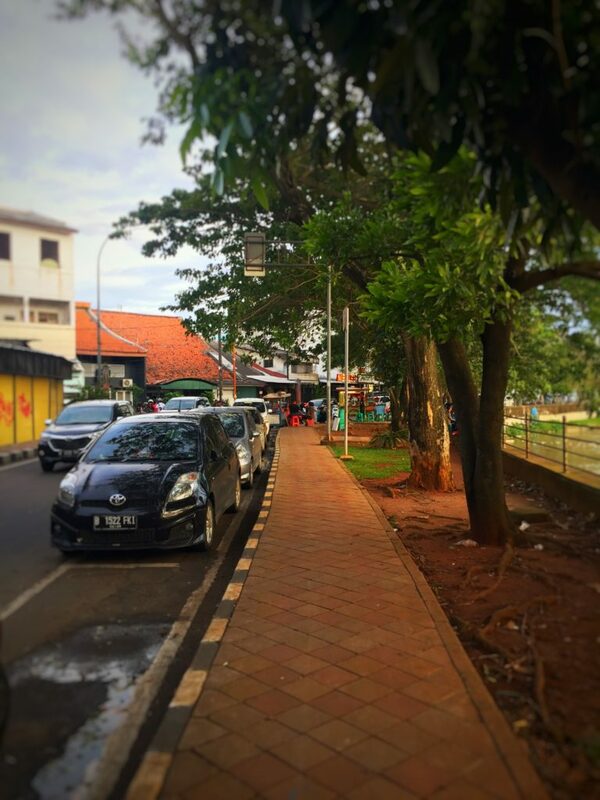 Not far from Pasar Lama is Pasar Anyar (or new market), Tangerang train station (the western end of Jabodetabek’s electric rail network), and other places of interest….. But they are stories for another day. Special thanks to KPK++ (Riris Tamba, Tintin Irawati Punjabi, Silvia Rianawati, etc.) for the adventure and photos.